As a drama, A Thousand Coloured Castles is a stellar performance. Brookes has created a story of disability and personal strength that is amplified by his formal experimentation. That’s a hard combination to find, and makes A Thousand Coloured Castles essential reading. Strikingly original and beautiful. Genuinely distinctive…The combination of narrative uncertainty, genuinely dark musings about what lies behind a suburban facade, childlike art and convincing characters is inspired. A perfect synthesis of form and content, and an essential purchase. Burns brightly with a remarkable story, a powerful sense of humanity, and a pull that will leave the reader picking this book up again and again. Graphic Medicine meets twee middle class suburbia in Gareth Brookes’s darkly comedic triumph… one of the most important creators currently working in UK indie comics. Using chalks and crayons, as well as panels that evolve in colour and form, Brookes creates a kaleidoscopic experience that is full of humour and disquietude. A wonderful work… such a powerful take on suburbia and marriage. Brookes is an observer of rare and delicate insight. A thoughtful, considered and beautifully observed piece of work. Brooke explores a genuine medical condition with insight and sensitivity, as he asks the reader to think about their responses to others in distress. Absolutely wonderful. You have managed to explain this horrible condition exactly as it happens to people. Brilliant. The ambiguity of what we mean by ‘real’ visual experience is masterfully depicted. I particularly liked the wry humour of Fred and Myriam’s aging relationship: Myriam’s worries about what she is seeing and how she and her family deal with it will be entirely familiar to the thousands of people that have gone through a similar situation. A beautiful book… The way the drawings can move and coalesce from the mundane and everyday to the fantastical and unaccountable makes the hallucinatory experiences palpable and disturbing. Gareth Brookes is one of the most surprising comics creators working anywhere in the world. A Thousand Coloured Castles is entirely rendered in shimmering layers of coarse waxy crayon. The effect is astonishing, unsettling and strange. An extraordinary achievement. I really, really love it. If the future of UK comics doesn't go where Brookes is taking it then I'm not interested. Gareth Brookes has made a small name for himself in the art comics scene due to his experimentation with materials and form. His first major graphic novel, The Black Project, used a combination of embroidery and linocut to give the work a distinct visual style. 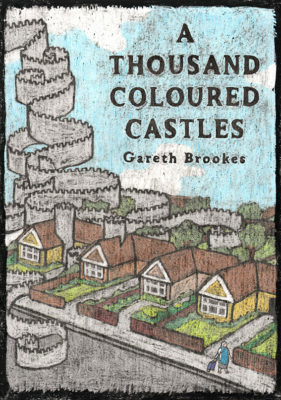 Now Brookes is back with a new book A Thousand Coloured Castles with a similarly experimental style. A Thousand Coloured Castles features an aging English couple, Myriam and Fred, whose lives are slowly disrupted by Myriam’s loss of vision and development of Charles Bonnet syndrome, a hallucinogenic disorder that occurs when a person loses their vision. Charles Bonnet syndrome is relatively common in patients with severe vision loss, but often misdiagnosed as dementia or psychosis. Myriam is also sure something strange is going on next door, but the only person willing to believe Myriam is her four year-old grandson Jack. For this project, Brookes has used a combination of overlaid crayon layers that are quite appealing. Each page is constructed using a base image, which is then covered by a thick layer of black wax. Brookes then scratches off that overlayer, leaving the panel borders and flecks of black wax engrained in the base image. The technique lends a darkness to the images which echoes throughout the comic’s plot. All of the bright colors are muted and darkened, becoming almost grainy with the application of that overlayer. Brookes also chooses to illustrate the characters without faces, which makes sense for the medium. It also emphasizes Myriam’s continual vision loss and detachment from reality. We see children in crash helmets float into the ceiling, watch flowers and vines sprout from everyday objects, all the while Fred is demanding another cup of tea, or a hard-boiled egg and toast. While A Thousand Coloured Castles is a fiction that bases most of its visuals around a disease, it’s a story of strength and perseverance. Myriam, the (likely) long-suffering wife of Fred, handles her vision loss and hallucinations with a stoicism and determination. Fred is more interested in the Guinness Book of World Records than his wife’s failing health, and their daughter is more interested in her inheritance than Myriam’s well being. She is not deterred by her husband’s nay-saying, nor is she willing to abandon her personal sense of justice because of a doubting family. I’m certain there’s a breed of reader out there that would find all of this humorous, a dark caricature of suburban life. There’s a certain absurdity to the whole book. A dingbat, facts-obsessed old man and his money-grubbing daughter act as the foil to a strong British woman. 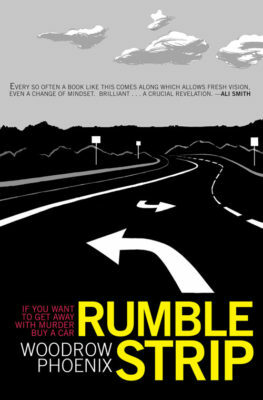 Brookes’ narrative cleans up rather nicely and in the end, it’s no harm and no foul. Myriam is an unspoken hero, and life trudges along. Fred gets the internet. But the looming family misunderstanding has disastrous consequences, and the threat of institutionalization is all far too real, far too brutal to ever be construed as funny. And that’s fine. As a drama, A Thousand Coloured Castles is a stellar performance. Brookes has created a story of disability and personal strength that is amplified by his formal experimentation. That’s a hard combination to find, and makes A Thousand Coloured Castles essential reading. 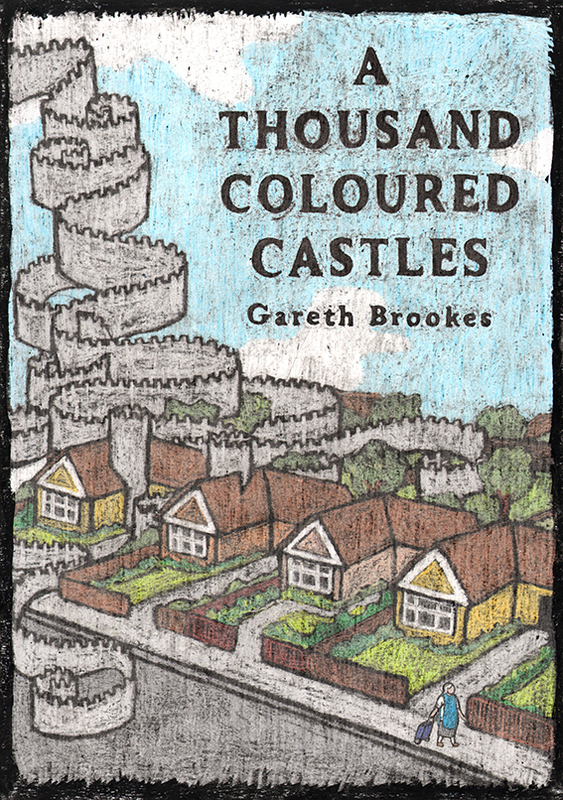 Gareth Brookes A Thousand Coloured Castles is a strikingly original and beautiful book. Somebody at Myriad clearly agrees, as this is the first hardback I’ve seen from them, and the printing is excellent. Myriam is a classical unreliable narrator, a woman experiencing vivid, childlike hallucinations that lead her husband Fred and adult daughter to suspect that she is losing her mind. She sees a boy next door that she thinks is imprisoned there, but of course she’s not believed. Fred is exactly the “no funny business” sort who is disinclined to respond well to his wife’s condition. He is a well-observed suburban retiree who can’t imagine why anyone wouldn’t have the time to keep their lawn immaculately mowed, with a sense of nostalgia based on how things have changed for the worse, without any corresponding desire to make things better. For example, he reminisces about a time when everyone knew each other in the area, but doesn’t take the opportunity to introduce himself to new neighbours when they move in. In a recent Broken Frontier interview Brookes talks about how he experimented with a technique remembered from primary school: coloured crayons, shaded over with black then scraped off again revealing the colour underneath. It’s a surprisingly effective technique that makes this book distinctive. The imprecision of the crayon artwork is profoundly sympathetic to the subject matter, with the lack of facial detail producing a distancing effect, and the childlike solidity of the drawings precisely conveying the vivid hallucinations. It gives similar pleasures to Sam Alden’s pencil work, the effect of seeing what’s on the page yet knowing we are not seeing everything there is to see, and is genuinely distinctive. The combination of narrative uncertainty, genuinely dark musings about what lies behind a suburban facade, childlike art and convincing characters is inspired. A Thousand Coloured Castlesis a perfect synthesis of form and content, and is an essential purchase. Flowers sprout out of the television, wild vines climb the walls and burst through the window. In the garden, alien children spin around - arms outstretched and helmets on their heads, narrowly missing troops of soldiers who parade down the street. It's disorienting and strange, yet I'm unable to tear my eyes away for a second... No, I've not just dropped a particularly potent tab of Acid but instead, I'm curled up on the sofa reading A Thousand Coloured Castles by Gareth Brookes, published by Myriad Editions. It's a beautifully drawn graphic novel that brings the mundane and the sinister together, forming a world that brings a truly unique viewpoint direct to the reader Myriam is an older woman living a fairly dull life - cooking and cleaning for her husband and passing time in their suburban bungalow. Things are tame - stale even, but then Myriam starts seeing strange things. Walls rise to block her path, people with bird faces greet her from the garden and strange children spin through the streets in an endless procession. Both her husband and daughter instantly think that she's gone mad - and proceed to worry more about the implications for their futures than how Myriam might be coping with the things that are happening to her. Myriam, however, has her concentration elsewhere - convinced that a young boy is being held captive in the basement of the house next door. Determined to investigate, she's forced to see through the strange visions to the truth of what is really happening and finds herself an unlikely ally in her grandchild. Brookes art is something that takes a little bit of getting used to - the murkiness of the colours and the lack of detail initially proving distracting, but a few pages in it becomes clear that the art represents the mundanity of Myriam's everyday life perfectly, a little reminiscent of the images of everyday life in the North that Lowry was crafting in the 20th Century. There's a real sense of claustrophobia in the scenes of home life, and it fits well with the portrayal of Myriam and her husband - a couple who've been married all of their lives and seem to have run out of any kind of conversation. She cooks, cleans, and goes to the shops - but it becomes very clear that Myriam is a woman who is existing rather than truly living. The colour in her life, and in the book itself, comes from the visions and hallucinations that start to appear in Myriam's world - visions that are both vibrant and unsettling. Whilst the more outlandish hallucinations are wonderfully depicted, it's the smaller ones that shake the reader the most - a door handle seemingly multiplying and preventing Myriam from getting in the house, or a man’s tie and collar flying off while he's in the middle of selling door to door, show the loss of control that Myriam faces - and brings it to life for the reader in a startlingly immediate fashion. TWISTS THAT ARE SHOCKING AND VISCERAL The art is undoubtedly the focus here, but Brookes writing serves as a perfect companion to the images. Sparse words in cursive text help make Myriam's journey a surprisingly touching one - illuminating both her loneliness and her confusion as events escalate around her, and enabling the reader to like and care for Myriam almost as soon as they begin reading. She's a lead character who says little - but everyone will know or have known an elderly lady like Myriam, helping to draw the reader into the story even more, eager to find out the cause of her problems and to help her solve them. Two central mysteries are explored in some detail in the book - the main one being Myriam's hallucinations, but a secondary plot about a child being held captive soon becomes the centre of Myriam's life. It's a clever move, as the reader isn't sure whether the child is real, or part of Myriam's visions - and it's a plot that's resolved with twists that are shocking and visceral, drawing the reader out of the fantasy world created by Myriam's hallucinations and back into a stark and brutal reality. That reality is where Brookes takes Myriam's story and uses it to explore a real but little-known medical issue. The graphic novel is the perfect format for exploring the condition (which won't be revealed here for fear of spoiling the plot), but also the loneliness and isolation that many old people face. Not that this makes this a gloomy read though - Myriam's spirit and Brookes beautiful art allow and uplifting spirit to pervade through the darkness - and I daresay you'll close this book with a smile. ‘You won’t have read anything quite as unique as this before - a graphic novel that seems initially rather mundane, but burns brightly with a remarkable story, a powerful sense of humanity, and a pull that will leave the reader picking this book up again and again. This re-imagining of twee middle class suburbia, as seen through the fractured lens of a distinctively Brookesian eyeglass, is a visual triumph. 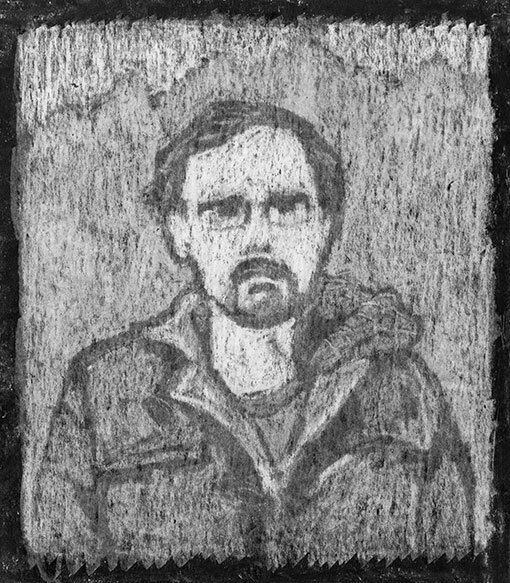 There are things we have come to expect from a Gareth Brookes comic… A certain bleak humour would be one; quiet reflections on the futility of the human condition another; and it wouldn’t be a Brookes offering without the dark undercurrent that courses through all the artist’s work. But of all the recurring aspects of his oeuvre it is, ironically, its unpredictability that is its most familiar element. Brookes has a constant urge to play with medium, structure, presentation and form which means that, although all his comics are recognisably Brookesian in scope and theme, each one is a distinctive and discrete entity unto itself. The book sits somewhere between graphic medicine and middle class suburban thriller and centres on the lives of Myriam and Fred, an elderly couple living in quiet domesticity until strange goings-on in the house next door begin to impinge upon their everyday lives. Brookes invites the readership to dissect the events of each mindbending page and to sift through the clues as to what is real and what is imagined, while at the same time he impishly muddies the narrative waters. There are no boundaries to perception here in a world where subjectivity rules and the objective is redundant. While The Black Project was Brookes’s crossover book with its dark wit and familiar examination of gauche boyhood providing an accessible entry point and an appeal to non-traditional comics readers, A Thousand Coloured Castles speaks the language of comics with a dialect that the uninitiated may perhaps find a little harder to comprehend. But, make no mistake, this re-imagining of twee middle class suburbia, as seen through the fractured lens of a distinctively Brookesian eyeglass, is a visual triumph. In terms of challenging the boundaries of the form, constantly pushing it into new arenas and exploiting its every storytelling possibility, Gareth Brookes (alongside Karrie Fransman) is undoubtedly one of the two most important creators currently working in UK indie comics. Our perception of the world around us is infinitely more powerful than reality itself. We convince ourselves of how things are or how they should be, but rarely does this carefully constructed narrative match those of other people. In his new graphic novel, A Thousand Coloured Castles, Gareth Brookes explores the conflict between perception and reality, and how the former will always cloud our experience of the latter. Using chalks and crayons, as well as panels that evolve in colour and form, Brookes creates a kaleidoscopic experience that is full of humour and disquietude. Myriam is an elderly woman whose life is interrupted by the appearance of visions that begin to follow her everywhere. Objects are manipulated and distorted; people, animals and structures appear, growing in both size and number. As she tries to make sense of her unpredictable environment, she sees a boy being held captive in her neighbour’s house. Convinced something is deeply wrong, she tries to investigate, much to the dismay of her husband Fred. Highly critical of Myriam and everyone else, Fred is convinced that his wife is “barmy”, showing little patience or tolerance for her precarious mental state. We still don’t see many books that explore elderly characters or how aging affects the body and mind over a longer period of time. From the first page, Brookes presents Myriam and Fred as characters whose best years are behind them, worrying about changes in society and reminiscing about simpler times. Fred’s view of the world is extremely negative. He controls his environment through his trite insults and general dissatisfaction. If there’s a silence, he feels compelled to fill it with observations, convinced that his reality is genuine and unfiltered. Reading A Thousand Coloured Castles, especially Brookes’ characterisation of Fred, brings to mind the verse from William Blake’s poem The Marriage of Heaven and Hell: “If the doors of perception were cleansed, everything would appear to man as it is, infinite. For man has closed himself up, till he sees all things thro' narrow chinks of his cavern.” Fred has closed himself up, narrowing his perspective, offering only disappointed comments about TV, what women should wear, and what he thinks is good for Myriam. Myriam’s experience, however, couldn’t be more different. Her hallucinations, arresting as they might be, open her up to the possibilities of her perception. They are rhapsodic and confusing, evolving with her moods and the stresses in her life. She will be certain of seeing a budgie in a tree, only to be berated by Fred for making things up. When she leaves the house a car is engulfed in flames. Brookes uses these images to fill the story with visual metaphors that reflect Myriam’s emotions. He juxtaposes ideas of freedom and ascension with imprisonment, making her see soldiers with ladders on their heads, an array of birds, and the titular castles that wind through the air; these visions are stretching the aforementioned doors of perception, but when she feels judged by Fred, she sees a brick wall blocking her way. It takes great courage for Myriam to accept that it doesn’t exist and pass through it. Brookes also contrasts absurdity with realism, even within Myriam’s psychedelic hallucinations. As her condition worsens, instead of strange creatures appearing around her, her perception of everyday objects becomes warped. Items of clothing and door handles multiply and morph like something out of a Salvador Dali painting, and she becomes too confused to decipher between real and imaginary. The same applies to his use of language. Fred and their daughter Claire are set in their ways, quick to blame Myriam for her condition and behaviour instead of trying to understand her. Brookes uses a motif of these two constantly saying things have gone “down the drain”, an abstract image associated with banal things. Just as a day cannot literally go down a drain, neither can Fred and Claire separate themselves from their absurd perception of Myriam. An interesting meta-narrative runs through A Thousand Coloured Castles. Brookes draws without faces, forcing us to project our own emotional assumptions onto each character. When Myriam sees these hallucinations for the first time only for them to disappear, we experience the same disorientation that she does. For Fred, Brookes adapts the panels to focus on the intense minutiae of his routine. Every cup of tea and boiled egg is meticulously chronicled, increasing from four panels per page to 12. His methodical and repetitive routine is a mirror of his opinionated nature; he believes he knows exactly how everything should be done. His perception is reality, and Myriam no longer abides the rules of his narrative. It’s not much of a spoiler to reveal that Myriam is suffering from Charles Bonnet syndrome, a condition where hallucinations appear to the sufferer but they are able to distinguish them from reality, just because of how strange they are. But if she can see them as clearly as she sees her husband or her grandson, they must be real enough to merit taking seriously. All that is required from other people is a sliver of empathy and an open mind about the reality of perception. …all in all, a wonderful work. A Thousand Coloured Castles explores hidden dramas on a suburban street. Myriam is married to Fred, who is the kind of man whose entire existence revolves around a series of catch phrases that ensure their life together is contained within narrow margins and routines. He is a man who thinks he is observant but who perceives nothing, which means Myriam has no idea how to tell her husband that she thinks she is losing her mind. The crayon drawings seamlessly move in a series of panels from the ordinary to the extraordinary. Brooke explores a genuine medical condition with insight and sensitivity, as he asks the reader to think about their responses to others in distress. A … thoughtful, considered and beautifully observed piece of work that will resonate with anyone going through a similar situation and help to increase understanding. 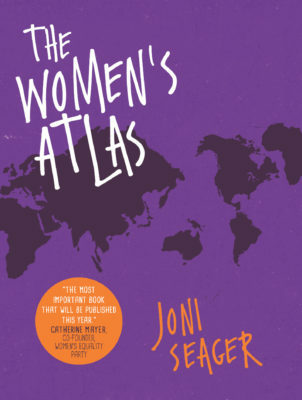 This book is, simply, genius. Disturbing and unsettling to read, but a great story, it’s well deserving of the kudos it has already earned and I have no hesitation in recommending it. 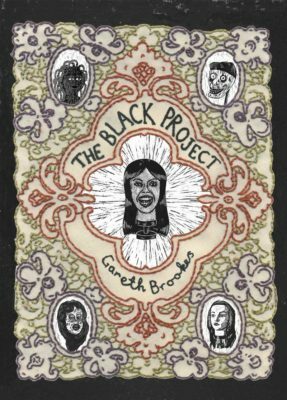 Told throughout using crayons to give an “astonishing, unsettling and strange” effect, I have to agree with the team at Gosh that this is one of 2017’s “must reads” – if you enjoyed Gareth’s The Black Project, released back in 2013, then you’ll already know in part, what to expect. With a great ear for dialogue and strong characterisation, alongside art that’s for me, the visual equivalent of running fingernails across a chalkboard, I was throughly captured by this suburban nightmare. Seek and buy! The artistic style and graphic novel format perfectly covey Myriam’s fading visual world and the episodic nature of her experiences. Myriam’s story will help others understand what the experience is like and why someone might hesitate to talk about it. Perhaps more importantly, it will help those affected reveal their own, personal visual adventures for the first time. A beautiful book… The way the drawings can move and coalesce from the mundane and everyday to the fantastical and unaccountable makes the hallucinatory experiences palpable and disturbing. The parallel unfolding of the genuinely strange and distressing story of the goings-on next door play against the dreary ‘normality’ of Fred and Myriam’s marriage. The resolution of the story is both moving and acute, suggesting that the power and limits of our imagination define the extent of our empathy. Gareth Brookes is one of the most surprising comics creators working anywhere in the world. His previous book, The Black Project, was filled with painstaking embroidery; A Thousand Coloured Castles is entirely rendered in shimmering layers of coarse waxy crayon. The effect is astonishing, unsettling and strange - much like the weird, beautiful visions intruding on the central character's view of the world. Brookes' drawings emerge out of the shadows, and part of the trick with this book is working out which shadows are real and which are figments of an old woman's imagination. The book's great and lasting power comes from its recognition that the darkest shadows - and the brightest wonders - can be found in the most ordinary of people. An extraordinary achievement. I really, really love it. Gareth Brookes has an uncanny ability to locate the sinister root of the suburban and the familiar and twang it mercilessly. This brilliant, sharply observed and often hilarious story of Little England through a hallucinatory lens leaps from the page like so many ladder-headed soldiers. If the future of UK comics doesn't go where Brookes is taking it then I'm not interested.